On the 29th of August 2017 the RINGO project was presented to the Advisory Council for Aviation Research and innovation in Europe (ACARE) Working Group 5 at their regular meeting. 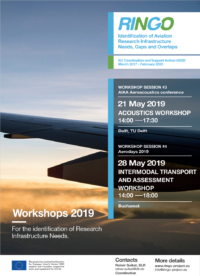 The ACARE WG5, which is responsible for the topics Infrastructures and Education, is tasked with the definition of a European Roadmap for Validation Infrastructure to pave the way for reaching the FlightPath 2050 goals and visions. The RINGO project has been launched to specifically support WG5 in this task, hence a close working relationship between RINGO and ACARE WG5 needs to be established. During the meeting, the RINGO project, its approach and current status have been presented to the group and discussed in a very open and fruitful manner. The relevance of the RINGO results for WG5 has been highlighted and agreed. As a first result, it was agreed that the RINGO project will be a regular agenda item on future WG5 meetings to ensure a continuous contact and exchange. In addition, WG5 has offered support to the RINGO projects in the ongoing tasks.